Purchase two levels at Wal-Mart, Camping World or local RV outlet. One should be large enough to read from the cab of your truck. I like the type with the large scale and has a large ball bearing in the tube. The other level can be smaller. You will also need a level you can use temporarily to insure the trailer is level before attaching the two permanent levels. Using a level driveway at home or other level concrete slab is the easiest but do what you have to to get the trailer level. Install the large level wherever you want on the front of your trailer as long as you can see it from the drivers seat of your tow vehicle. Install the small level on the side of the trailer where you can watch it as you operate the tongue jack or landing gear. Now that you can tell if you travel trailer or fifth wheel is level you’ll need a way to make it level. If you have a single axle trailer I believe the commercially made plastic leveling ramps are the best solution for you. They are inexpensive, lightweight and durable. If your trailer has two axles, you will need three lengths of 2 x 8 wood with no knots or cracks. Since tires should never be allowed to hang over the edge of your leveling boards I like to use 8″ wide ones just to allow a little fudge factor. The length of first board is determined by measuring the distance between the axle hubs and adding about 18 to 24 inches. The board should be long enough to allow each tire’s footprint to be completely on the board with a little fudge factor so you will be able to stop the rig before rolling off the back of the board. How well you can control the rig when backing onto the boards will determine the actual length of that first board. The second board should be cut 5″ longer that board one. Board three should be cut 5″ longer that board two. If you want, you can bevel one end of each board but it isn’t really necessary. I can’t remember ever needing more than three boards to get the trailer level although I suppose it is a possibility. But for a two axle trailer that fourth board is going to be pretty long so make sure you really need it or maybe cutting it in half is a good idea. Anyway I generally only need one or two boards. You may need an assortment of smaller boards for use under jacks and stabilizers although I like the plastic ‘blocks’ for this use. Again, they are inexpensive, lightweight and dribble as well as stackable. Okay, you have your levels installed and you have your leveling boards. You should find leveling your trailer fairly easy if you follow the instructions below. Many RVers, especially old timers, may tell you that the RV has to be perfectly level in order for the refrigerator work correctly. In the old old days, this was the case, but manufactures changed the design a little to make leveling less critical. Unless your RV refrigerator is twenty years old, it only needs to be reasonably level. The rule of thumb is that if the RV feels comfortably level,to you then it is level enough for the refrigerator. Using the leveling boards you made before your trip, place one or more beside the LOW side tires. When using more than one board stack them as a ramp so the wheels roll up the boards one at a time. Drive the rig forward or backward enough to clear the board(s). Position the board(s) in the tire tracks. Determine where in your campsite you want to park the trailer. Ideally you’ll want to find the most level area of your campsite and place the trailer there. But there lot of reason why you may want to park the trailer somewhere that is not level. Always level side to side first. Using the leveling boards you made before your trip, place one or more in front of or behind the LOW side tires. Drive onto the board(s) and recheck your level. Repeat this adding or removing wood as needed. (After you’ve done this a procedure a few times you’ll be able to tell by the level how many boards you need.) This method results in the trailer being parked as much as three feet from its original position. If that works for you okay. But if you want to be level in the original spot use the Alternative Method to the right. When you are satisfied with the side to side level you can chock the wheels, detach your tow vehicle. Use the tongue jack (travel trailer) or landing gear (fifth wheel) to adjust your front to back level. When you are satisfied that your trailer is reasonably level (perfection sometimes alludes us) then lower any stabilizers to the ground to reduce rocking and bouncing. There are heavy duty plastic blocks you can purchase to use instead of carrying wood. Your choice. 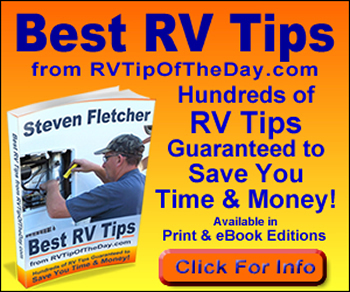 Choosing an Recreational Vehicle – Which RV Is Right for You?